Lisa May Thomas is a dance artist trained at Laban London and specializes in working with the moving image. Starting points come from her observations on the moving human form and a curiosity around the language of the body and of the stories, memories and experiences it contains. Her practice is led through somatic enquiry, improvisation and authentic movement techniques. 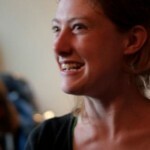 She has worked substantially with new technologies, specifically with Interactive Scientific on the project ‘danceroom Spectroscopy’, a multi-award winning Sci-Art collaborative project which explores new languages and crossovers on the interface of physics research, interactive arts, education, performance and technology. As a dance artist and film-maker, I often begin a journey of devising and creating movement for both the screen and live performance through explorative movement tasks and improvisation techniques. Often, my starting points are driven by the need to create an internal focus, in order to create the dance from the inside out, so that the intention of moving is fueled by a memory, internal feeling or sensation from within the body, and not from an external and visually-driven outcome or incentive. 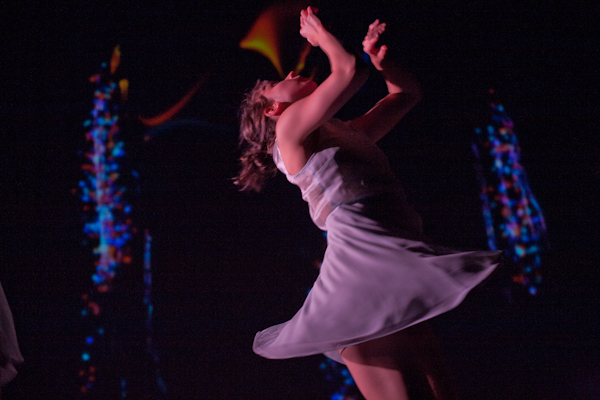 Playing with the technologies of danceroom Spectroscopy (dS), I began to dance with my virtual avatar, moving particles in and out of my body and across the space in what appeared visually as dynamic fluid motion. This was a new experience for me and, as a dance improviser, I had instant visual feedback on my actions which then brought further intention to move. Moving from an internal place had shifted to moving to make visual sense on the screen in front of me. It was at this point that I acknowledged the huge potential for a collaborative exchange between this system, its inventors, and the medium of contemporary dance. Once in the studio, a important first consideration for the dancers was how best to instigate the devising process. Should we work together in the space, to connect with each other and our ideas before introducing the technology? The presence of the technology in the space can be all-consuming, and it felt important to find some time and space away from this visually-driven environment to find some initial movement intentions which came from a more internal place. However, after some consideration, we decided to go for it and to work with the technology from the start: it was very chaotic, but it was also very alive and dynamic and with the feeling that anything could happen. Through the unique collaboration that this project brought to life – between four dancers, one scientist, one choreographer, one composer, one interactive sound designer and a computer programmer/visual artist – there was a significant amount of translation needed between disciplines, in order to understand each other’s needs and languages. All the elements – the technology, the sound, and the movement – needed space and time to develop and evolve. As this creative process evolved, we began to find a shared language eventually bringing us to a place where we all knew what we meant, a strange code by which we worked. For example, we developed our own vocabulary to refer to the rules of the space (e.g. calibration, the mapped area, the seams on the screen between the cameras, being more or less powerful in the space etc); the names we gave specific scenes or states which then evolved into sections of Hidden Fields; the sounds or music we wanted to hear, the sections of the dance; the form of each others energy avatars. It was important to develop an understanding between each other through quick language and shorthand. Through the act and process of improvising and creating together, we moved through states and ideas quickly and it was important to keep track of what was happening and what worked and what didn’t. dS is an interactive visual simulation of the atomic nano world. It brings to life through visual form the invisible world of particles which are attractive or repulsive to energy fields. It is governed by the idea that everything in the world around us is dynamic and that these dynamics are categorized by particles interacting via energy fields and energy landscapes. It is the nature of these landscapes that guide atomic motion, the fluid flow of particles from one place to another. The system is based on simple principles of attraction and repulsion, yet at the same time has the propensity to look and feel incredibly complex and chaotic. The nature of the movement of particles through this virtual system meant that what we created visually with our bodies could never be replicated and that no two performances could ever be exactly the same. It is of course the same with any dance performance, that we can never re-play the same move in the same way twice with the same audience. But with dS the varying degree of change was greater and the likelihood for new things to happen was high. I enjoyed the improvisatory dynamic that the complexity and chaos of the system posed for us as performers, and also the feeling of not quite knowing how the system would respond to our movements on any given day. The states or scenes in dS that we would choose to work with were more often than not selected collaboratively by the team and agreements on what worked visually on the screen were mostly unanimous. dS allows a large degree of flexibility in its aesthetics, due to the many permutations of size, number, colour and speed of particles; the number of dancers in the space; and the dynamic and pace of the movement amongst other things. We sometimes found that what worked visually did not translate to feeling good in our dancing bodies. An important part of the creative process arose in negotiating between the worlds of visual effect (on the screen) and felt sensation (of the dancers) – i.e., how we could remain embodied whilst at the same time creating a desired effect in the virtual ‘world’ in which we were embedded. The visual on-screen aesthetics seemed, to me, to be the most important element of what we were aspiring to create and sometimes it was difficult to prioritise this in devising movement material. At the point of making choreographic choices, another consideration was whether to and at what point(s) we should turn away from the screen to face an audience. In the act of doing this, it would mean that our movements would not arise in response to the visuals, but would rather be more pre-set. With our backs to the screen, the visual artists involved in the dS devising process would undertake an improvisatory process, attempting to ‘organize’ the chaos of the system in a certain way as to semi-predict the pathway of certain visual ideas that we wanted to communicate. For me, this shifted the process a great deal in terms of the intention of the movement, our relationships to each other as performing bodies in the physical space, and the nature of the connection between the live and screen-based environments. The narrative structure of Hidden Fields emerged for us over time, forming a loose conceptual framework from which we could all find our own themes and ideas to sit within. Through this structure, moments of light and darkness would arise and fade. And these would be accompanied by differences in pace and dynamic. For example; the fast and dynamic “Cosmic Dance” emanates from the stillness, darkness and silence in the “Back to the World” section. The ending reminds me of Jane Bennett’s worlds in her book on vital materialism: ‘we are it and it is us’. [ii] We eat and drink food from our earth and when we die we become the earth. There is only so much energy in the world, and it only ever changes form. The first law of thermodynamics tells us that energy can be neither created nor destroyed.